Sausage consists of meat, cut into pieces or ground, that is stuffed into a casing along with other ingredients. Ingredients may include a starch filler, such as breadcrumbs, seasoning spices and sometimes vegetables. The meat may be from any animal, but most often is pork, beef or veal. More common today are sausages made from chicken and turkey. The lean meat-to-fat ratio is dependent upon the style of sausage. Speciality sausages with other ingredients, such as apple and leek, are also popular. In some jurisdictions foods described as sausages must meet regulations governing their content. For example, in the United States, The Department of Agriculture specifies that the fat content of different defined types of pork sausage may not exceed 30% to 50% by weight. Italian sausage must be at least 85% meat. Most Italian sausage contains salt, pepper, fennel and/or anise and no more than 3% water. Optional ingredients permitted in Italian Sausages are spices (including paprika) and flavorings, red or green peppers, onions, garlic and parsley, sugar, dextrose and corn syrup. The italian Sausage i buy from Fortuna does not contain any preservatives or sweetners and is low in fat. See the post I wrote recently on this type of sausage. The U.S. Department of Agriculture mandates that fresh sausage contain no sodium nitrite and/or potassium nitrite or nitrates. However, cured sausages normally contain one of these preservatives, which are suspected of contributing to cancer. Many people are allergic to nitrites and nitrates, as well as some fillers, such as soy, so beware of these ingredients in commercial cured varieties. Read the ingredients label. There are a number of brands available today without nitrates. Cured varieties also contain high amounts of salt, necessary to the curing process, which could be a potential problem for those with high blood pressure. Precooked chicken sausage is convenient. Keep a package or two on hand to accompany Sunday morning pancake breakfasts or to sauté with sliced peppers and onions for a quick weeknight dinner. Two brands that I like are Applegate Farms and Al Fresco. These companies also make excellent breakfast sausages. 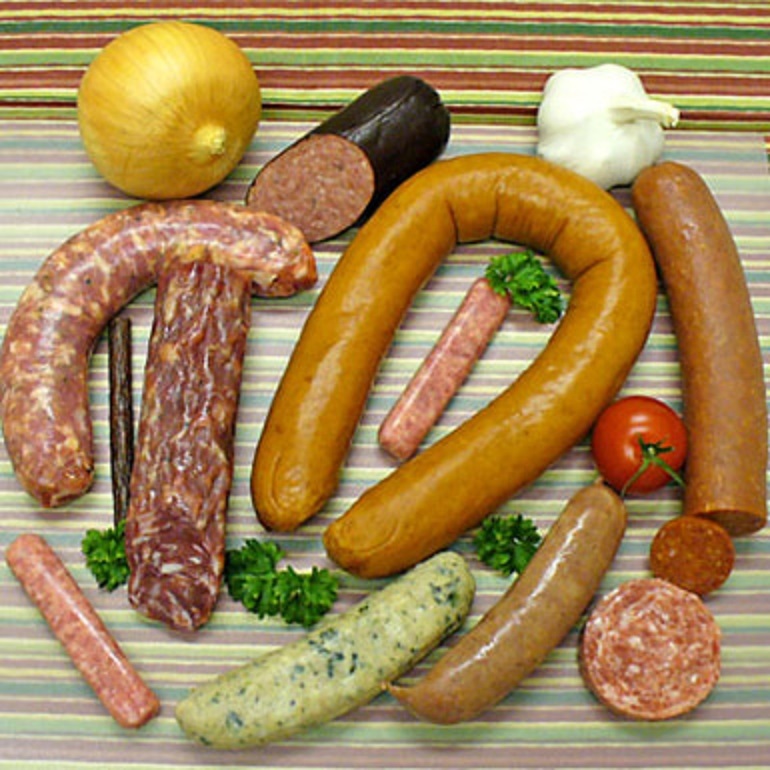 Many traditional styles of sausage from Europe and Asia contain only meat, fat and flavorings. In the United Kingdom and other countries with English cuisine traditions, many sausages contain a significant proportion of bread and starch-based fillers, which may comprise 30% of the ingredients.The filler used in many sausages helps them to keep their shape as they are cooked. As the meat contracts in the heat, the filler expands and absorbs moisture and fat from the meat. Many nations and regions have their own characteristic sausages, using meats and other ingredients native to the region to create their traditional dishes. There are a wide variety of different sausages available throughout the world, however, they all fall into just a few basic categories. Cooked sausages are made with fresh meats and then fully cooked. They are either eaten immediately after cooking or must be refrigerated. Examples include hot dogs, Braunschweig and liver sausage. Cooked smoked sausages are cooked and then smoked or smoke-cooked. They are eaten hot or cold, but need to be refrigerated. Examples include kielbasa and mortadella. Some are slow cooked while smoking, in which case, the process takes several days or longer. Fresh sausages are made from meats that have not been previously cured. They must be refrigerated and thoroughly cooked before eating. Examples include Boerewors, Italian pork sausage, siskonmakkara and breakfast sausage. Fresh smoked sausages are fresh sausages that are smoked and cured. They do not normally require refrigeration and do not require any further cooking before eating. Examples include Mettwurst and Teewurst which are meat preparations packed in sausage casing, but squeezed out of it to serve (just like any other spread from a tube). Dry sausages are cured sausages that are fermented and dried. Some are smoked, as well, at the beginning of the drying process. They are generally eaten cold and will keep for a long time. Examples include salami, Droë worst, Finnish meetvursti, Sucuk, Landjäger (smoked), Slim Jim and summer sausage. Bulk sausage refers to raw, ground, spiced meat, usually sold without any casing. Vegetarian sausages are made without meat. The ingredients are usually soy protein or tofu, with herbs and spices. Some vegetarian sausages are not necessarily vegan and may contain ingredients such as eggs. Unless you are cooking sausages in a casserole dish or in a sauce, the key to great-tasting fresh sausages that do not get dried out is this: simmer them in beer or water until partially cooked and then finish in the oven or on the grill or stove top. 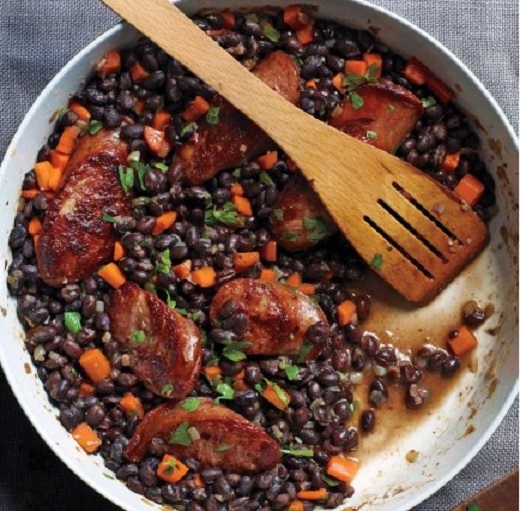 Fall is a popular time of year to cook with sausage. Tailgating and heartier meals are perfect for this meat. To keep sausage recipes healthy be sure to buy sausages that are pure meat with no fillers and not too much fat or salt. 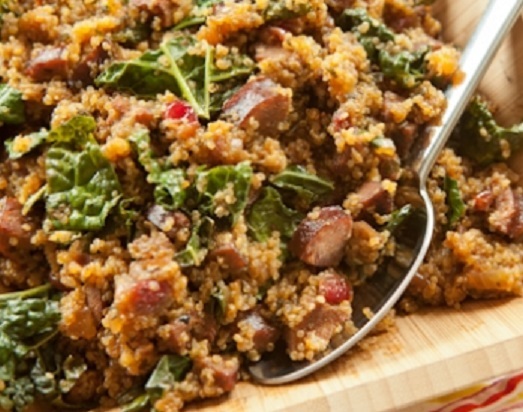 Stretch the amount of sausage used with vegetables and hearty grains. Great for busy weeknights. 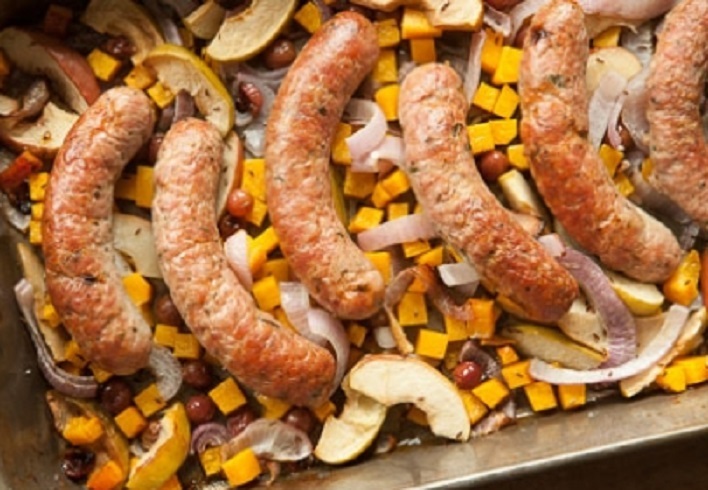 The apples and butternut squash in this recipe go well with bratwurst, but any mild sausage will work. Preheat the oven to 450°F. In a large roasting pan or rimmed baking sheet, combine squash, apples, grapes and onion. Sprinkle with oil, caraway seeds, salt and pepper and toss to coat. Arrange brats over the top. Roast until brats are browned and hot all the way through and the squash is very tender, about 35 minutes. In a large skillet with a cover, cook sausage, onions and sage over medium-high heat until just browned, about 10 minutes. Add cider, quinoa, cranberries, salt and 3/4 cup water and bring to a boil, scraping up any browned bits. Cover, reduce heat to medium-low and simmer until liquid is just absorbed, 25 to 30 minutes. Stir in kale, cover again and set aside off of the heat for 5 minutes. Uncover, fluff with a fork and serve. The flavor of the dish will vary depending on what type of chicken sausage you choose. 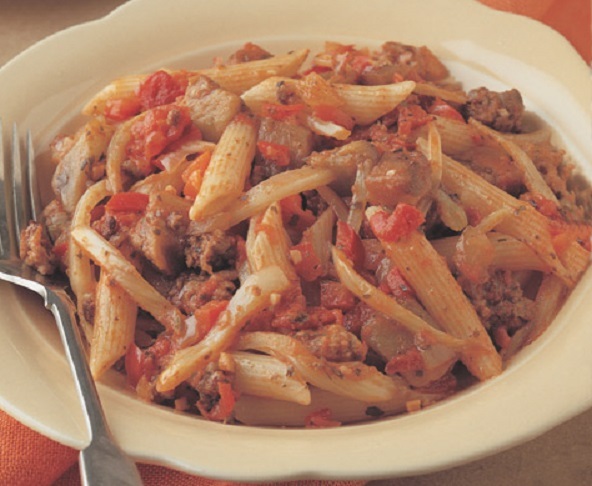 Roasted garlic or sweet apple sausage are best for this recipe. 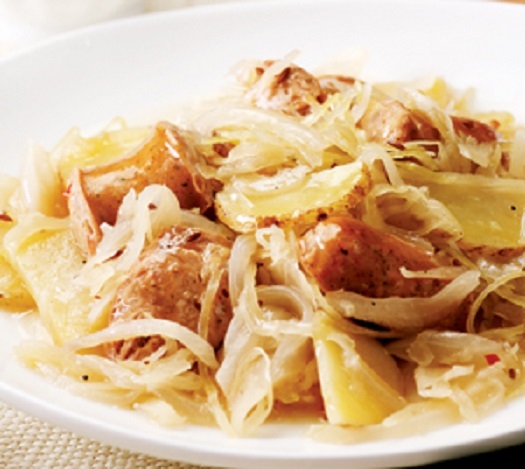 Opt for the crisp texture of refrigerated sauerkraut over canned. Serve with roasted carrots and some mustard to spread on the sausage. Heat oil in a large skillet over medium heat. Add sausage and onion and cook, stirring frequently, until beginning to brown, about 4 minutes. Add potatoes, sauerkraut, wine, pepper, caraway seeds and bay leaf; bring to a simmer. Cover and cook, stirring occasionally, until the potatoes are tender and most of the liquid has evaporated, 10 to 15 minutes. Remove the bay leaf before serving. Heat oil in a large nonstick skillet. Add the bell peppers, fennel bulb, onion, eggplant and garlic. Cook, stirring often, over medium heat for 5 minutes, or until the fennel starts to soften. Add the sausage. Cook, breaking up the sausage with the back of a spoon, for 3 minutes, or until no longer pink. Add the marinara sauce, fennel seeds and red-pepper flakes. Stir to mix. Cover and reduce the heat to low. Cook for 20 to 25 minutes, or until the vegetables are tender. Meanwhile, cook the pasta to the al dente stage. Reserve 1/2 cup of the pasta cooking water. Place the pasta in a serving bowl. Top with the sauce. Add the reserved cooking water and parmesan cheese. Mix well and serve. In a large skillet, heat oil over medium-high. Add sausage and cook until browned on all sides, about 8 minutes. Transfer to a plate. Add carrots and shallots to the skillet and cook until beginning to soften, about 4 minutes; season with salt and pepper. Add garlic and cook 1 minute. Add black beans and broth and bring mixture to a boil. Add sausage, reduce heat to a simmer, and cook until carrots are tender, about 12 minutes. Remove from heat and stir in parsley. Serve with hearty country bread. Oh yum. I love how many variaties there are of sausages. What a lovely post! I like your different takes on creating delicious recipes with sausages. The varieties caught my eye and once again landed me on your page! An excellent post! My eyes went right to the sausage and penne! I don’t think I’ve craved pasta dishes as much as I do in Italy! When I return it will be sausage and veggies! I like the recipe with quinoa. Thank you, especially for taking time to comment on your fabulous trip. This is such an informative post! Where do you learn all this? Thank you Grace. Years and years of cooking experience and a love of history is where I get my stuff. Interesting as always. These are such great ideas. I really like chicken and turkey sausages. I’d love to learn how to make them myself and even venture into charcuterie. In due time maybe. A like a variety also. I know you can buy sausage making kits and add your own meat, that would be a day long project I am sure.